All Bimini Tops sold by Boat Covers Direct come standard with the hardware needed to use the top. The fittings that are mentioned below are either Bimini top replacement hardware, or parts that aren’t needed for installation of the top, but will aid in ease of its use. See our line of full Bimini tops if you are interested in pricing a new top for your boat. 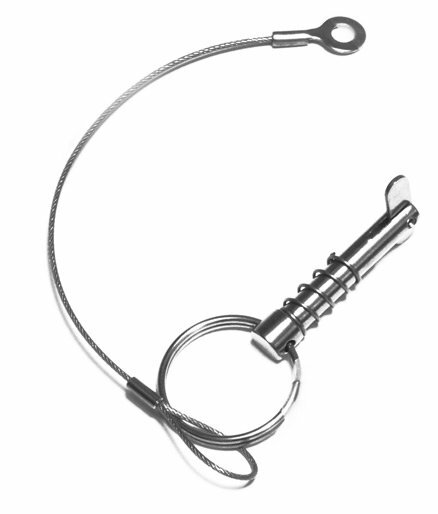 Our hardware is offered in two types- nylon and stainless steel. Nylon fittings come standard on our Bimini tops. All of our nylon fittings are manufactured in the USA. Our nylon fittings are black in color. 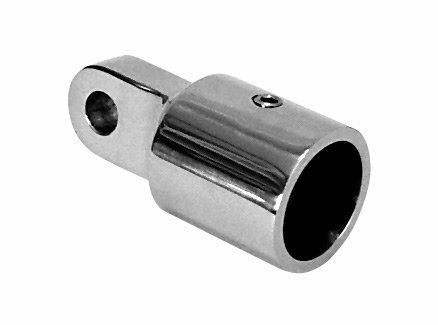 Stainless steel fittings are an upgrade from the standard nylon fittings that come on the top. The stainless used is marine grade, 316 composition. Deck hinges are one of the most common items to be replaced on a Bimini top. These are what the long/main bow of your Bimini top will affix to, and they are the main mounting points for the attachment of your top. 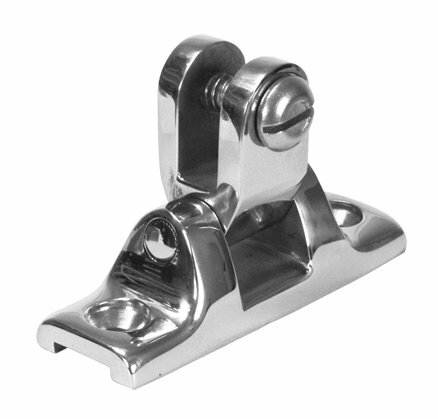 Deck hinges come in different types- the most common being the universal/ swivel deck hinge. This deck hinge allows you to mount the top to any flat surface, no matter the angle. 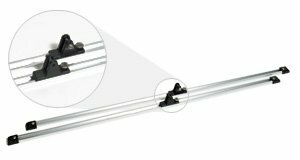 Universal deck hinges can be used to mount on a 90 degree surface, on the inside or outside of the gunnel, or even to an angled windshield. 90 degree deck hinges are made to be mounted on flat, 90 degree surfaces only. Deck hinges with sliders are only to be used in combination with a slide track kit, which is mainly common on fishing and bass boats. Deck hinges drilled for quick release pins are made specifically to be able to allow you to remove the Bimini top without drilling. Quick release pins should be ordered with that particular type of deck hinge- these are also available in our accessories section. 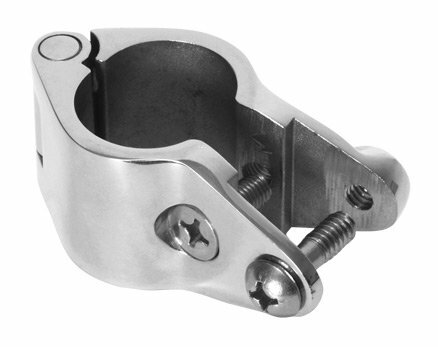 Our deck hinges are offered in nylon or stainless and will work for square or round tube Bimini tops. Eye ends are the fittings that affix to the end of a bow, allowing it to connect to either a jaw slide or deck hinge. Outside eye ends are made to attach to the outside of the bow, like a collar. These will be secured with a set screw. Outside eye ends are available in nylon or stainless, square or round tube. Jaw slides are used as connector pieces on a Bimini top- they will connect the small and medium bows to the long bow on a 3 bow top. These are also used with brace kits. Jaw slides are available in hinged or non hinged versions. A hinged version is recommended, as this type can mount to the bow without removing it from the top. Non hinged versions work just as well, but require you to slide them up the bow, meaning you have to remove your top to install them. 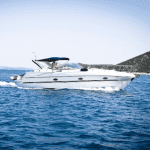 Jaw slides are available in nylon or stainless, and for square or round tube Bimini tops. Other types of hardware include rail mount adapters– these allow you to mount the top to a surface that is not flat, like a railing or windshield. Simply mount the rail mount adapter to your mounting surface, then screw the appropriate deck hinge on top of it. Also available are bimini top eye straps– you mount these to your boat and then clip your hold down straps to them to secure the Bimini. Lastly, quick release pins are offered to allow you to remove your top without unscrewing it. Simply insert the pins into your deck hinges instead of screws, and you now have an easy way to install and remove your top with no need for a drill. 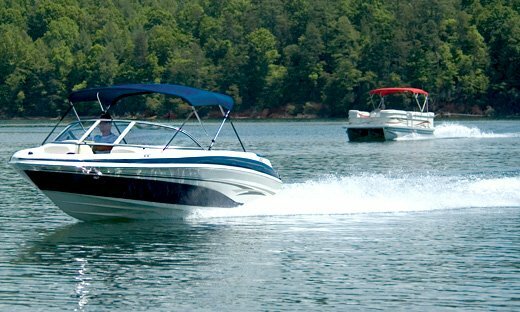 Order your replacement hardware online from BoatCoversDirect.com, and it will ship the same business day if ordered before 3 pm eastern. Should you not see the hardware you are looking for, give us a call. We are happy to check on the availability of other hardware for you. Boat Covers Direct® is happy to offer you an additional 5% off our online price if you just mention this blog post! Call us today at 1-866-626-8377 or send us an email at info@boatcoversdirect.com. We have everything you need to ensure you can enjoy a day on the water in the shade of your top! Next: Need Sunbrella Material? We Can Help! Previous: It’s Time for the Bassmaster Classic!